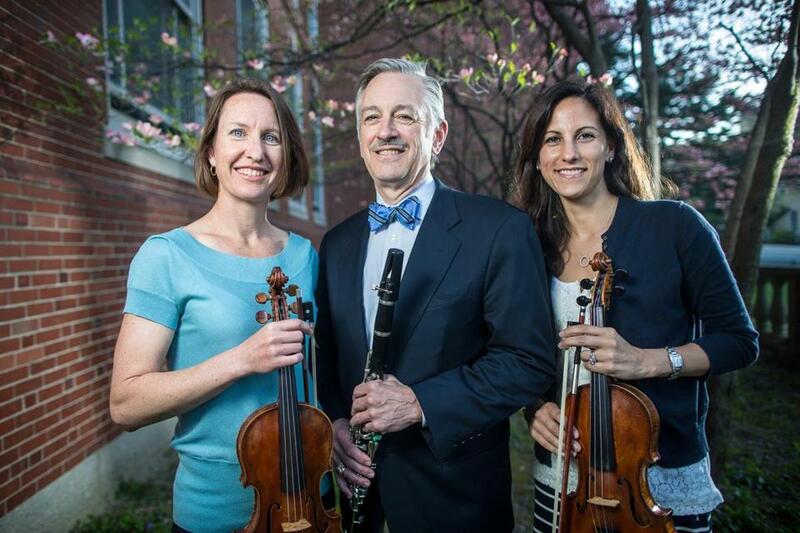 From left: Longwood Symphony members Dr. Heidi Harbison Kimberly, Dr. Mark Gebhardt, and Ramona Nee. Ramona Nee, a lawyer from Sherborn, ran her first marathon on April 15, despite having torn a muscle in her calf about two weeks before. She ran as part of the Dana-Farber Marathon Challenge team, honoring several people in her life affected by cancer. She was elated to have crossed the finish line, but by the time she’d picked up her belongings, her muscles had stiffened in the chilly spring sunshine, and she was hobbling. So a Dana-Farber volunteer helped Nee make her way toward the Marriott Copley Place hotel, where she was to meet her husband, daughter, and in-laws. She wanted to get one more glimpse of the finish line, so the pair walked behind the grandstand, in front of the Boston Public Library, to get to the hotel. That’s where they were when the first bomb went off. Even though they were shielded from the direct blast, the force of the explosion knocked them over. Mark Gebhardt is the chief of orthopedic surgery at Beth Israel Deaconess Medical Center. Since it was a holiday, he was at home working when his pager went off. He turned on the TV and knew immediately that his team, which treats injuries to bones and muscles, would be pressed into heavy service. Gebhardt lives within walking distance of the hospital and arrived there in minutes. The ambulances had already begun to roll in. Upcoming classical music and opera performances in the Boston area. Nee, Kimberly, and Gebhardt are three of the thousands who played a role in the Boston Marathon day events. They are also musicians who play in the Longwood Symphony Orchestra, an elite ensemble that draws most of its performers from Boston’s medical community. The Longwood’s motto is “healing the community through music,” and it’s hard to think of a time when such a palliative was more acutely needed. The orchestra is dedicating its concert this Saturday to the bombing victims and it has added Elgar’s elegiac “Nimrod,” from the “Enigma Variations” as a special tribute. It is also offering free tickets to staff at the city’s five major hospitals, creating a venue for caregivers to sort through their experiences and search for a sense of peace. For Nee, the immediate aftermath was dominated by confusion. She’d last seen her family at Mile 25, at the designated Dana-Farber cheering section; she knew they’d been planning to walk the last mile and meet her at the hotel. She tried, unsuccessfully, to call her husband. She kept dropping her phone, and her legs were so sore that she couldn’t even bend over to pick it up. “At that point, the panic a little bit starts to set in,” she said. She would learn later that her family had turned off Boylston onto Ring Road, next to Lord & Taylor, carrying them to the other side of the street just before the first explosion occurred. One of the eeriest scenes Nee remembers is finally entering the Marriott room where the Dana-Farber runners were to be received. Most were still on the course, so the room was filled with massage therapists and chairs for runners who would never arrive. There was an uneasy stillness. Through the windows Nee could see SWAT teams. Fifteen minutes later, she was reunited with her family. Their joy was shadowed by the slowly dawning sense of what they had just experienced. Her 6-year-old daughter had heard someone talking about the injuries as they ran from the scene. “Her first question to me was, ‘What’s a multiple amputee, Mommy?’ ,” Nee said. At Brigham and Women’s, Kimberly and her colleagues had less than 10 minutes to clear the emergency room and prepare for the crush of bombing victims. “We’re used to taking care of trauma,” she said. “The medical part was kind of the easiest. The challenge was partly the volume of patients that arrived.” The Brigham would treat 39 patients; Kimberly said 19 of them arrived in the first half-hour, many among the most critically wounded. The first patient she treated was a young boy. “The fact that they would bring him to us instead of Children’s Hospital made me wonder, what’s going on out there?” He was crying and couldn’t tell Kimberly his last name or his parents’ names. (He was later transferred to Children’s and reunited with his family.) The second patient was a woman with shrapnel in her neck. But an unflappable sense of calm dominated. This was her job. Meanwhile, Gebhardt was overseeing his team of orthopedists, ensuring enough resources to handle the victims at Beth Israel. Since the explosions had happened at shift change, some people stayed on to help. Others, like him, simply knew to come in. EMTs also reacted quickly, judiciously parceling out the injured among the city’s trauma centers. Environmental service teams cleaned and prepped operating rooms quickly enough to accommodate the next patient. Nutritional services workers made sure there was food and drink for patients, their families, and the exhausted medical teams. The totality of the response, Gebhardt said, reminded him of a well-trained orchestra. “On the surface, it looked like there were a bunch of people running in different directions. But in fact, everybody knew exactly where they needed to be. Everyone immediately assumed their roles. It was like they had rehearsed a piece. Saturday’s concert will create a space for caregivers, victims, families — united that day and ever after — to reflect and to heal. Kimberly, a violinist, says she’s always viewed music therapeutically, as a release from the anxiety and tensions of her work. It’s why she’s played in the Longwood since 1999. She’s been thinking especially about the second suite from Ravel’s ballet “Daphnis and Chloe,” which is on Saturday’s program. “It’s not a melody you hum along to a lot,” she said. “You just get caught up in the sounds. It’s a good piece to listen to and process. Nee, a violinist who also is on the Longwood board, won’t be playing Saturday’ but will be in the audience, reflecting on the twist of fate that brought her family so close to tragedy, and that kept them safe when others weren’t. And also, of course, about healing the community.